Is your cat shedding excessively? Are you finding cat fur on your clothes, furniture, and constantly floating in the air? While it is not as disturbing as cat litter being everywhere, this problem still calls for an action plan. And here it is! In this article, you are going to find out why cats shed fur, what is considered to be normal and excessive shedding in cats, and how to stop your cat from shedding so much. Why do cats shed fur? But despite common-sense logic, shedding is not dependent on temperature. You won’t stop your cat from shedding by turning the heat down. Shedding is initiated by the amount of daylight available. When the amount of light reduces in autumn, the need to grow thicker fur is signaled by the cat’s body. The opposite happens in spring, when the amount of light increases. However, changes in the coat are not the same in indoor cats who are exposed to large amounts of artificial light. While most cats shed when their coats change in spring and, to some extent, in autumn, some cats, especially exclusively indoor cats, can shed throughout the year. Do all cats shed equally? There is also an interesting question. And the answer is that not all cats shed as much as each other. First, there are cats with no hair, such as Sphynx or Peterbald cats. Obviously, they do not shed. Second, there are also cats that, although they have a coat, they still shed less than “regular” cats. Those are Siamese, Burmese, Cornish Rex, and Devon Rex, to name the most popular breeds of this type. Is your cat shedding excessively or is it normal? It is completely normal for a cat to shed. Moreover, it’s completely normal for a cat to shed a lot. A real, real lot. 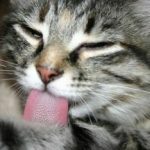 So, how do you know if your cat is shedding as it should? THe best way of finding out is to check your cat’s coat quality. If your cat is losing hair excessively, you should visit a veterinarian. 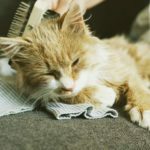 Even if you do find out that it’s normal for your cat to lose so much hair in the spring, it’s better to be safe than sorry. IMPORTANT: If your cat develops bald patches on the skin, it is never related to excessive shedding. The most common reasons for this are parasites, allergies, dermatitis, and stress-related over-grooming. Visit a veterinarian if your cat has bald patches on its skin. The most effective way to reduce your cat’s shedding is by giving it a regular brushing. This helps to collect fur before it falls out of your cat, meaning there will be less fur on your furniture and in the air, and that less fur will be ingested by your cat, leading to a lesser amount of hairballs. How often should you brush your cat? It’s okay to comb your cat thoroughly a few times – let’s say two to three times – per week. Long-haired cats may require more frequent brushing as necessary to reduce shedding. 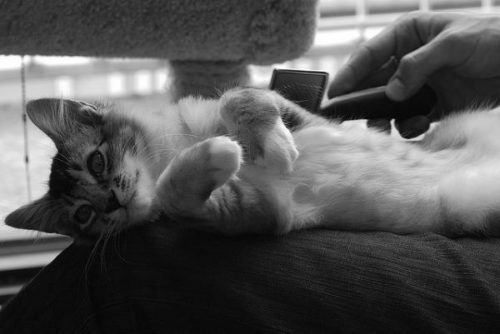 The more often you brush your cat, the less he or she will shed. Besides reduced shedding, brushing also helps to maintain coat quality and prevents hairballs and mats. It also gives you a chance to spend quality time with your cat. You can find more information about brushing a cat here. Do you need to bathe cats? Some sources say that you can bathe your cat to reduce shedding. 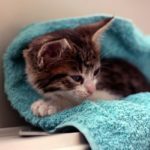 Although this may help, bathing a cat is not mandatory and could create more shedding in certain cases as it causes stress. Read more about bathing a cat here. Even if your cat does not shed excessively, his or her coat quality may appear poor. Previously, we have discussed how switching your cat from dry food to wet changes the coat quality and affects other aspects of your cat’s health. One of cornerstones for a healthy coat is proper hydration, which is easier to achieve with wet food, since it contains approximately 8 times more water than a dry diet. But it’s not only about water. The coat quality of a cat also depends on certain minerals and amino acids, and especially on fatty acids Omega 3 and Omega 6. A deficiency in Omega 3 and Omega 6 leads to a dull and dry coat, hair loss, and greasy skin, and may also worsen certain skin infections. The good news is that the skin regenerates rapidly. While symptoms from fatty acid deficiency develop quickly (within a few months), cats can also recover quickly if their dietary needs are met. If you use a commercial cat food, check the label to see if it contains Omega 3 and Omega 6. Also, make sure your choice of brand contains the other properties of a good cat food, too. If you prepare your cat a homemade diet, check the recipe and see if it contains a source of fatty acids and if the author of recipe is reputable. If you don’t follow a recipe, you should start doing so. How to remove cat hair from everything! A damp towel. Just rub the surface you want to clean with a damp towel. It will attract the cat hair. Our cats love to sleep on our laptop bags and we clean them every day with a wet cloth. Works like a charm – and it’s free. A lint roller. This picks up more cat hair and leaves the surface cleaner, but may be hard work if you need to clean larger areas. This method is good for removing cat hair from clothes but is not as good for chairs, sofas, and larger items. Remember that you will not be able to stop your cat from shedding altogether because it is a natural process, like eating or sleeping. However, the advice above – especially about regular brushing – may help to reduce the amount of hair that falls out and may improve the quality of your cat’s coat.